Brian Gilhuly of the Selkirk Golf & Country Club is the fourth recipient of the annual Golf Manitoba Distinguished Service Award. Brian has been a volunteer since 1986 both with the Manitoba Golf Association and Golf Manitoba. His initial start as a volunteer came as a club representative for the Selkirk G&CC and as a starter and scorer in tournaments. He joined the Manitoba Golf Association Board of Directors in 1989 and has continued on the Board since the amalgamation with the Manitoba Ladies’ Golf Association in 2004. He was the finance chair from 1990 to 2005. He became a course rater in 1991 when the present course rating and slope system was adopted and became the Chair of the Handicap & Course Rating Committee in 2001 following the retirement of Gord Lenton where he continues in that role. To date, Brian has completed 177 course ratings. He has volunteered as a walking scorer at St Charles for the LPGA tournament in 1992 and the PGA Champions Tour event in 2000 and was also a hole marshal for this year’s CN Canadian Women’s Open. When he is not volunteering for Golf Manitoba, Brian devotes countless hours to the Selkirk Golf & Country Club where he has served on various committees since 1958. He has been a Board member at Selkirk from 1960 to 1974 and again from 1986 to present. He is also the current treasurer of the club where he has been since 1988. The Selkirk G&CC recognized his long standing commitment to the club in 2004 by honoring him as a life member. Brian Gilhuly spends countless hours travelling to measure courses prior to actually conducting a course rating. He also spends a lot of time in front of his computer working on ratings as well as trips into the Golf Manitoba office to process the ratings. His devotion to amateur golf is extremely evident in his passion for course rating as well as his dedication to the Board and Association. 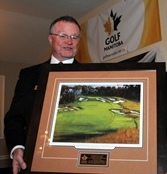 “Brian’s long term dedication to the game of golf exemplifies what it means to be a Golf Manitoba volunteer” said Harvey Goehring, President of Golf Manitoba. “His passion and professionalism for course rating is a true asset to our Association. His diligence in all he does is indeed outstanding and we are pleased to recognize him with the Distinguished Service Award”.